Neste importante catálogo publicado por Laurens Hesselink da Antiquariaat FORUM BV vamos encontrar, entre muitas outras, estas obras de grande interesse para a história da colonização portuguesa e do relacionamento, por vezes conflituoso, com os Países Baixos/Holanda ocorridos durante a ocupação espanhola. 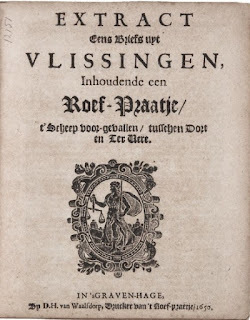 First and only edition of a pamphlet responding to the pamphlet entitled Oogen salve, printed at Rotterdam in 1650, probably by the same author as the Hollandsche praatjes. The Oogen salve argued, among other things, that consolidation of the Protestant faith was the main goal of the Union of Utrecht (1579), while the author of the present pamphlet, among other things, states the economic effects of the Union. 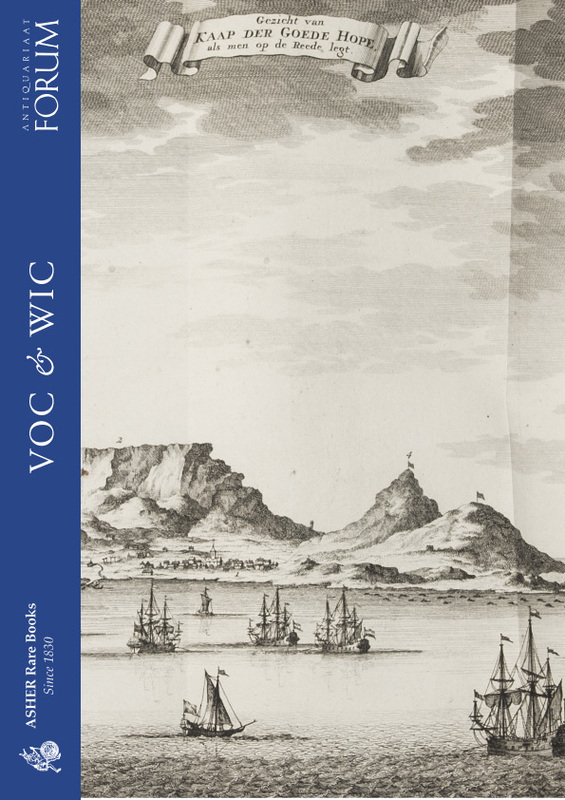 It includes comments on the WIC (Dutch West India Company) (p. 11), and Dutch colonies and conquests in Brazil (p. 16). Browned, with a few marginal spots, overall in good condition. 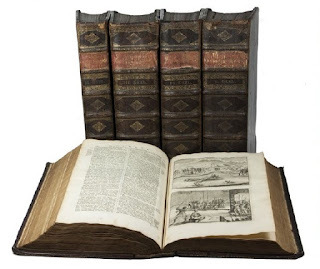 Second edition of a history of the colonial activities of the British East India Company, the Dutch East India Company (VOC) and the Portuguese in the East Indies, written by Philipp van Mökern, a merchant who lived in India for fifty years. 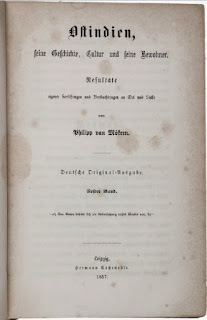 The work is divided into two parts, with a total of 32 chapters. Van Mökern starts with a history of India, it’s inhabitants, religion, art and science post Alexander the Great. Another chapter is devoted to various Muslim conquests in India and surrounding areas, the spread of Islam, and some of the first emperors of the Mughal Empire. The majority of the chapters deal with the Indian trade, the role of the Portuguese, the British and the Dutch in the East Indies, the shifts in power, the relations with the colonists and the native inhabitants, etc. Chapter 14 is devoted to the lives of Muslims in India in the early 19th century. Some chapters in the second part describe Mysore under Tipu Sahib (1750–1799) and the Anglo-Mysore wars. Slightly browned around the margins and some stains on the first few leaves. 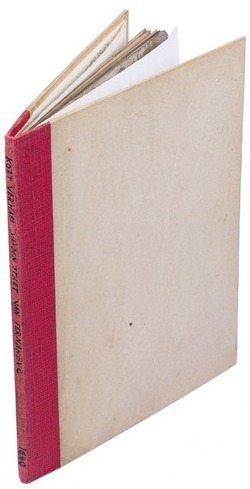 Binding slightly worn along the extremities. Overall a good copy. A. 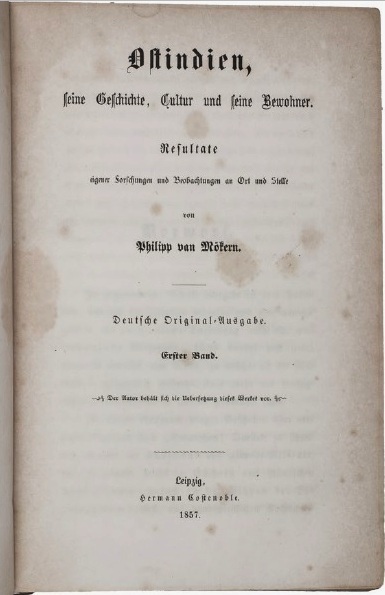 Beer, Allgemeine Geschichte des Welthandels, p. 186; Gesamtverzeichnis des deutschsprachigen Schriftums 98, p. 82. 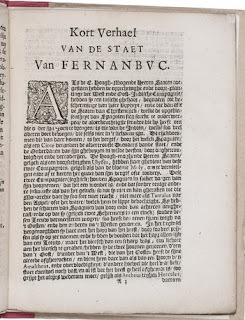 Rare first edition of the Dutch translation of a brief description of Pernambuco (Fernanbuc), a state at the east coast of Brazil, written by Auguste de Guelen. After various battles against the Portuguese, the Dutch gained control over Pernambuco in 1630, which at the time was the largest sugar-producing area of the world. Guelen opens with a brief letter to the directory of the WIC, stating he wishes to share the disturbances he witnessed and encountered during his last voyage to Pernambuco. 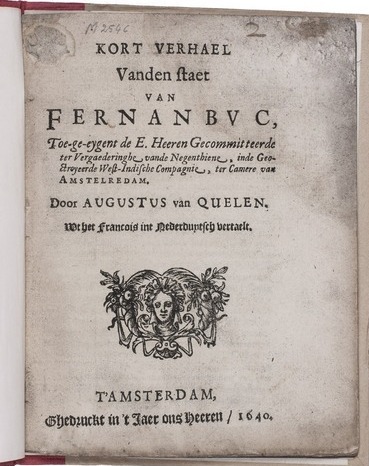 Guelen touches upon three different aspects of the Dutch rule in Pernambuco: warfare, trade, and justice. For each he describes the current state of affairs, tries to explain the causes for the unrest and gives a list of measures that might improve the situation. According to Guelen reform was most needed in the field of justice, stating justice was very hard to find and might even be absent for the subjects in Pernambuco. 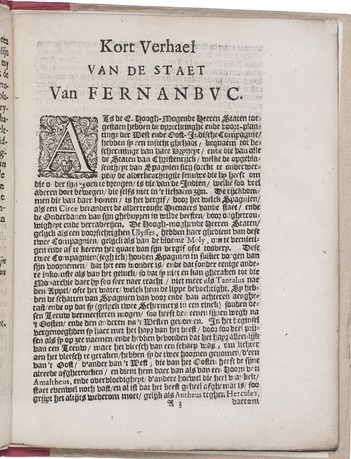 Title-page slightly stained, small piece torn off in the margin of leaf D1 (not affecting the text). Otherwise in good condition. Asher 156; Borba de Moraes, p. 696; Boxer, The Dutch in Brazil, 1624-1654, p.118; Knuttel 4689; STCN (5 copies); WorldCat (6 copies, incl. 2 the same). 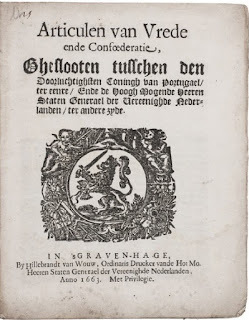 First edition of the Dutch translation of a provisional agreement made between the Dutch States General and the Portuguese ambassador Francisco de Zousa Continho on the jurisdiction and territory of Fort Galle in Ceylon (Sri Lanka), one of the most important outposts both strategically and as a trading center. The Dutch had captured it from the Portuguese in 1640 and they had been fighting in the region since that time. 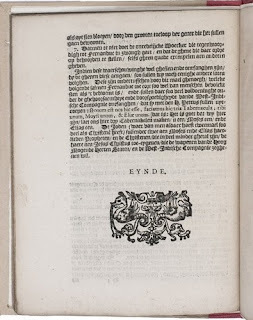 The treaty notes the losses and battles caused by the dispute between the two powers and the demands made by the Dutch government to secure their position in the East Indies. This includes their demand for a yearly supply of cinnamon, through which the Portuguese are to pay off their debt, and restitution by both parties for the losses they caused one another. The parties agree to honor the treaty and not trespass on each other’s rights and territories. Slightly creased, otherwise in very good condition. Knuttel 5202; Landwehr & V.d. 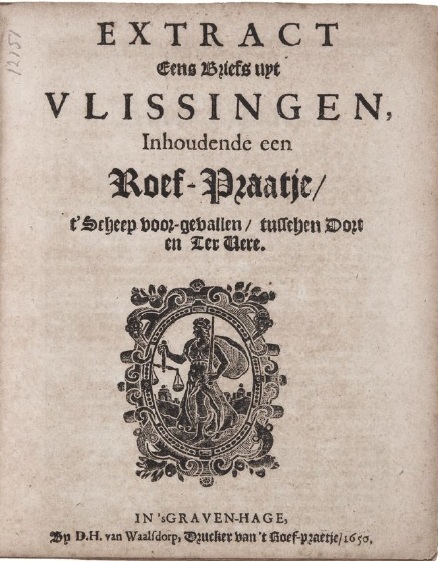 Krogt, VOC 242; STCN 852481330 (5 copies). Very rare first and only edition of a first-hand account of the rebellion of the Sinhalese natives, supported by the Dutch, against the Portuguese government of Ceylon (Sri Lanka), concentrating on the years 1623 to 1630, when the author’s father was governor of the island. The main text in Spanish, comprising a prologue and sixteen chapters, begins with a general description of the island, its emperors before the arrival of the Portuguese in 1505, the customs of the natives, and the Portuguese government. 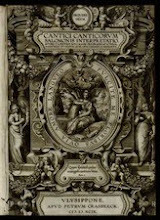 These are followed by an account of the author’s father, Constantino de Saa y Noroña (1586–1630), his taking office as governor and captain general, his principles of government and his reforms, his victories and conquests, and his achievements generally. Finally comes the rebellion itself, led by the King of Kandy, and its immediate aftermath, including the death of De Saa. Although the Dutch came to Ceylon in 1602 and encouraged disgruntled natives to fight against the Portuguese twenty years before De Saa took office, it was largely after his defeat and death in 1630 that the Dutch gained the upper hand in the struggle for control of Ceylon. It was only in 1658, however, that they succeeded in ousting the Portuguese and bringing the island under Dutch control. With the front board partially detached from the bookblock, otherwise in very good condition. An essential primary source on the native rebellion in Ceylon. Goldsmith, BMC STC Spanish & Portuguese R-163; Lach & Van Kley III, p. 951–952; Palau 274944. 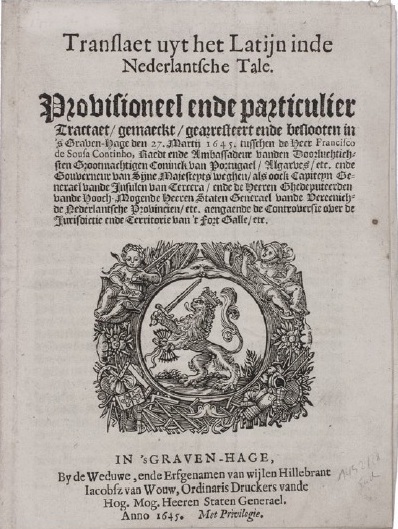 Second edition, of the Dutch translation of the peace treaty ending the Dutch-Portuguese war. 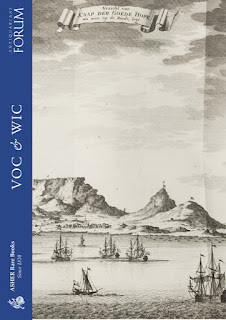 The WIC (Dutch West India Company) and VOC (Dutch East India Company) were at war with the Portuguese Armada, mainly to gain hegemony in the overseas colonies and trade. The war offi­cially ended in August 1661, though the peace treaty was not ratified until 1663. “The main provisions of the treaty were as follows. Portugal was to pay the United Provinces 4 million cruzados in sixteen years as an indemnity for the loss of Netherlands Brazil, ... 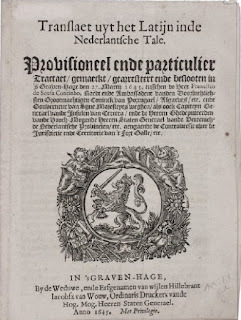 The Dutch were to be granted trade and residence in Portugal and her overseas possessions on the same terms as those already enjoyed by the English, or which might be granted to the latter in the future… The treaty was to be ratified within three months and published within six; but owing to the subsequent disputes and delays, the formal publication did not take place until March and April 1663” (Boxer). Slightly browned and the margins somewhat thumbed. Paper wrappers soiled and spine damaged. Still a good copy. Borba de Moraes, p. 50; Boxer, The Dutch in Brazil, pp. 253–255; Knuttel 8730. Espero que a selecção tenha sido do vosso agrado e votos de uma boa leitura e bom fim-de-semana.